I'd gone to Dyrholaey, outside of the village of Vik, in southern Iceland, in order to shoot the rising harvest moon, in early October, 2017. The sunset prior to the moonrise was great, and the moon itself was very pretty, but I primarily shot it, as I typically do, using a telephoto lens. On my way back to the car, though, after the moon had risen a fair bit over the horizon, I decided to do a more traditional, scenic landscape view. I liked what I was seeing, and played around a bit with different foregrounds and whatnot until I got this one that I really like. The moon – still orange from the sun which had set less than an hour before – was the primary source of light for this picture. 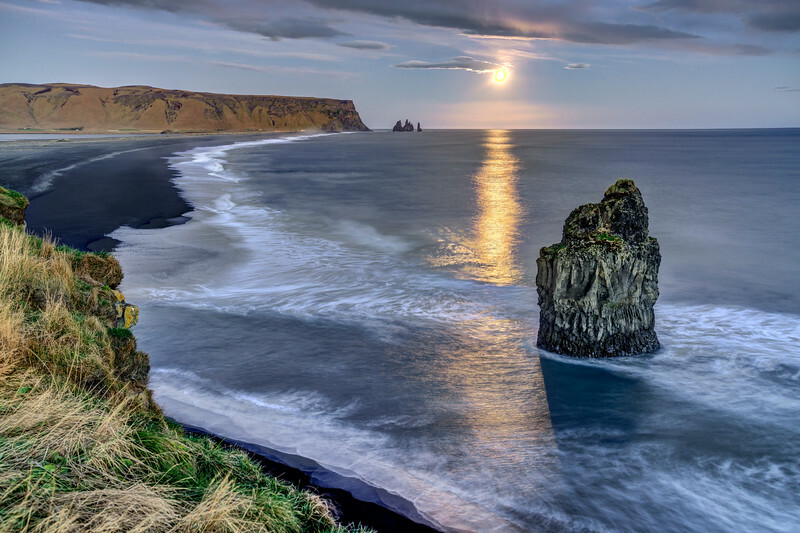 Check out the shadow of the sea stack on the right, caused by the moon.